Raaga.com: How Music Legend Khayyam took UMRAO JAAN as a Challenge! How Music Legend Khayyam took UMRAO JAAN as a Challenge! Dil Cheez Kya Hai Aap Meri JaanLijiye…. Music legend Khayyam, who gave film industry peerless melodies in movies like KABHIE KABHIE, RAZIA SULTAN, NOORIE, THODISI BEWAFAI, BAZAAR etc. but his score for UMRAOJAAN has made him immortal. February 18 marks the legendary music director’s birthday. 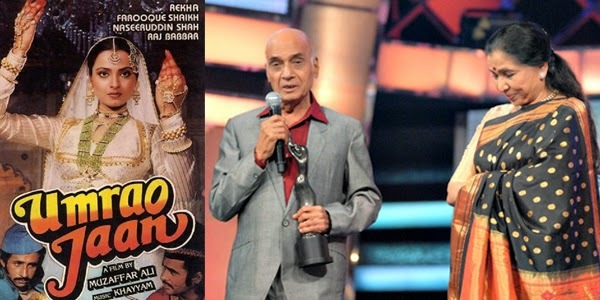 Raaga.Com wishes him birthday greetings and shares how Khayyam took UMRAO JAAN as a challenge and emerged a winner. "Then I started reading the history, how UMRAO JAAN became such a big singer, she was a brilliant dancer and she also did poetry and as I did my research the music came effortlessly,” he informs. Truly after the songs were recorded not only the nation was stunned to listen to a new Asha Bhosle but even Asha Bhosle herself was left astounded when she heard the songs as how different - and beautiful - her voice sounded. ‘Movie Mogul’ D Ramanaidu No More!